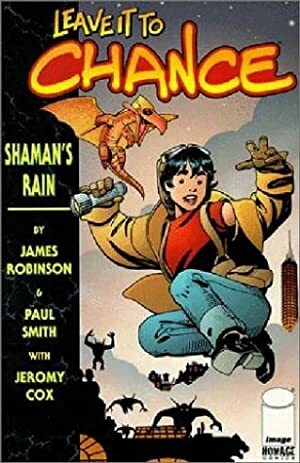 Leave it to Chance was a 1996-1999 series by James Robinson and Paul Smith. It was published by a young Image Comics, back when an awards-winning series like this was head-and-shoulders above most of their output. Robinson has described Chance as a cross between Nancy Drew and Carl Kolchak (the Night Stalker). 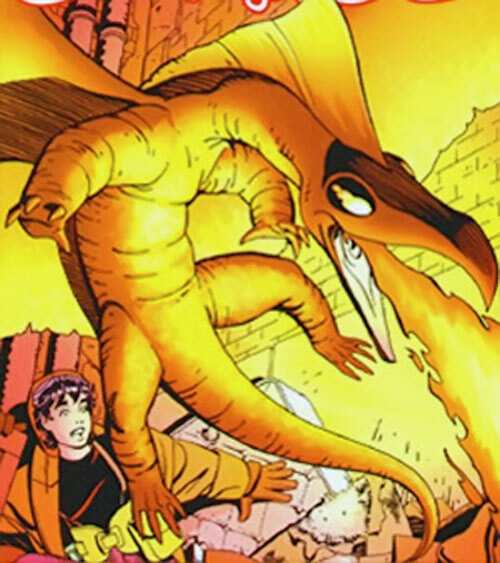 The “girl and her mini-dragon” theme is from artist Paul Smith, who had already given it a shot with Kitty Pryde and Lockheed. Real Name: Chance Louise Verdella Poe Falconer. Known Relatives: Lucas Falconer (father), Louise Falconer (mother, deceased), August Falconer (ancestor, deceased – the first Falconer hero), Savion Falconer (ancestor, deceased), “Mad” Jack Falconer (ancestor, deceased). Base Of Operations: Falconer estate, Devil’s Echo. Height: 5’3” Weight: 80 lbs. Age: 14 ½. Chance is the latest scion of the Falconer bloodline, and thus holds great potential. She is exceptionally brave and smart for her age. She also can casually execute remarkable stunts and acrobatics. Her father’s butler also taught her some boxing. Although she can’t hope to defeat an adult, Chance can punch pretty well for her size. She has access to the gigantic library (and labs) of her father, and owns a weird kid-sized flying car. Although she’s a competent teenage sleuth, Chance doesn’t forensics training. She mostly works by spotting clues and deducting correlations. On the other hand, she has a familial background in both science and occultism. Chance is notably charismatic and likeable. She usually gets respect and attention from adults – who nevertheless tend to be protective of her. Her family name is also an obvious social asset. Nobody wants to mess with a Falconer. St. George is Chance’s pet mini-dragon. It cannot speak, but they seem to communicate via some sort of telepathy. Chance talks to Georgie, and she understand his intentions telepathically. Chance has never explained that rapport, vaguely saying she and Georgie were buddies. St. George is brave, and seems to have full human-level intelligence. This creature is apparently from another world, and was captured by Lucas Falconer. The plan was to send him back to his world before George’s essence would bind to Devil’s Echo. Otherwise, the dragon became irretrievably linked to this plane. However the ritual had a distinct chance of killing the creature. Taking pity, Chance freed the dragon from his cage. Although he appeared at first to flee, he remained steadfastly loyal to her. Since it was too late to send it back to its homeworld, Lucas Falconer reluctantly allowed his daughter to keep her pet. 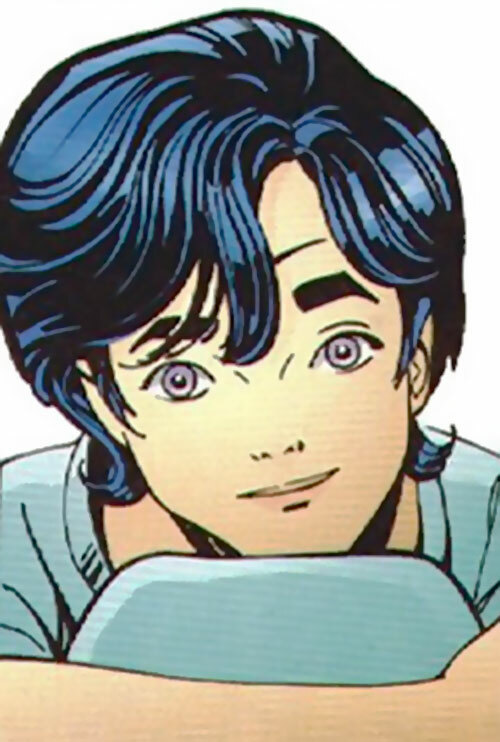 Chance Falconer is the youngest of the Falconer family, which gave the world a number of great occult investigators and heroic defenders. Her father, Lucas Falconer, is the Doc Savage of his world’s New York City, called Devil’s Echo. Her mother, however, was killed in terrible battle between Lucas Falconer and his arch-enemy Miles Belloc. During that battle, Lucas permanently acquired an inhuman visage. Chance’s world is overtly magical with goblins, fairies, monsters, magicians and the like. These freely in the equivalent of the 1990s America, though the styles (notably in cars and architecture) and more reminiscent of the 1940s. Still, magic and monsters remain somewhat mysterious for most people, who attempt to carry on mostly normal lives despite it. When Chance reached 14, she looked forward to being trained by her dad. Fourteen is the traditional age to initiate Falconers in the occult secrets. However, scarred by the death of his wife, Lucas refused to put his daughter in the line of fire. He decided to skip a generation. Lucas would keep her safe, let her grow up and have kids, and initiate her first-born son instead. But of course, the strong-headed Chance decided to prove her worth to her father by doing her own special detective work. 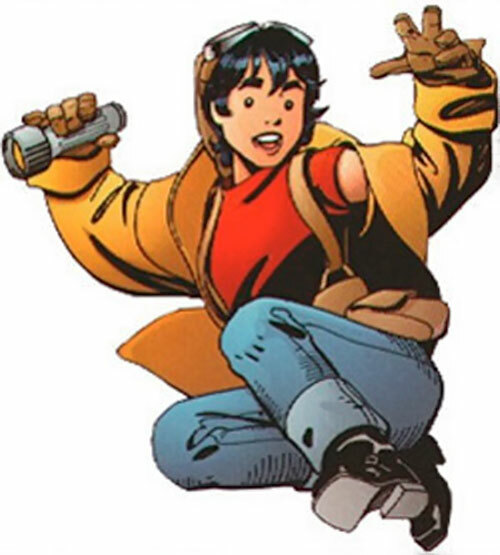 Whenever she drives her flying car, Chance wears a pair of WW I-style aviator goggles. St George usually sits at ther fore in a convincing impersonation of a baroque hood ornament. Chance is a brave, dynamic, curious kid. She’s had an excellent education with strong values, but she finds the sternness of her father boring and frustrating. She dearly want to prove her father she can be a great adventurer and do terrific stuff, too. 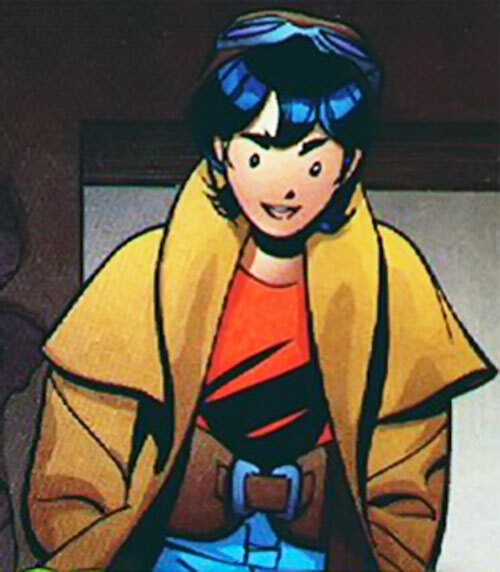 She’s also driven to do the right thing, solving mysteries and preventing catastrophes. Another part of her motivation is to see Lucas Falconer more often, as his workload prevent them from spending much time together. She’s much like the teenage sleuth from the mid-XXth century teenage detective literature. 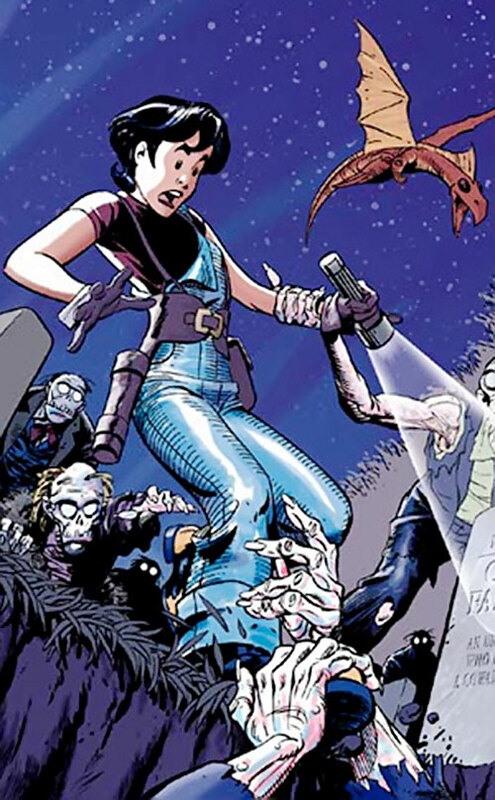 When confronted by the revenant of her mother and trying to prevent a zombie plague via the application of mystic machinery, Chance demonstrated heroic ability to handle the enormous pressure and think on her feet. She, however, collapsed in a crying fit after that – she’s still quite young. “I may ‘only be a girl’, but no one can tell me I’m not a Falconer”. Telepathy only works with St. George (-3). Telepathy can only provide rough concepts, not detailed discourse (-1). Animal Control is limited to convincing trainable animals such as dogs and monkeys that Chance is their friend (-2FC). Local Hero (Devil’s Echo, if she mentions she’s Lucas Falconer’s daughter), Pet (St. George), Financial Backer (Millionaire). Lucas Falconer (High), Officer Margo Vela (DEPD Arcane Crimes Unit, High), Will Bendix (High – star reporter at the Devil’s Echo Oracle), Jean-Pierre (an Haitian occult and mundane historian in the Bonne Terre neighborhood, High). Age (young), MIA to curiosity, Misc: Chance is lactose-intolerant, Misc. : body mass is 1 AP. AIR SLED [STR 03 BODY 05, Flying: 06, Running: 06, R#02]. Flashlight [BODY 04, Flash (steady illumination only): 04 – Chance wears it in a belt holster much like a firearm]. When she is not at the Falconer estate and cannot access her sled, Chance usually moves around with a skateboard. Altered anatomy (must be healed magically). Source of Character: Leave It To Chance comic books (Homage Studio/Image comics). Chance shares an universe with Hellboy (who has worked with her father) and Monkeyman & O’Brien (Kay, one of Chance’s school friends, is a big O’Brien fan).